William I, Prince of Orange (24 April 1533 – 10 July 1584), also widely known as William the Silent or William the Taciturn (translated from Dutch: Willem de Zwijger), or more commonly known as William of Orange (Dutch: Willem van Oranje), was the main leader of the Dutch revolt against the Spanish Habsburgs that set off the Eighty Years' War and resulted in the formal independence of the United Provinces in 1648. He was born in the House of Nassau as Count of Nassau-Dillenburg. He became Prince of Orange in 1544 and is thereby the founder of the branch House of Orange-Nassau and the ancestor of the monarchy of the Netherlands. Philip William, Prince of Orange (19 December 1554, Buren, Gelderland – 20 February 1618) was the eldest son of William the Silent by his first wife Anna van Egmont. He became Prince of Orange in 1584 and Knight of the Golden Fleece in 1599. When his father William the Silent ignored Alva's summons to return to Brussels, remaining in Germany, Philip William, only a boy of 13, was studying at the University at Leuven in Brabant. He was seized in February 1568, and taken to Spain partly as a hostage, but especially to be raised as a good Catholic and loyal subject. He would never see his father again, and his mother had died in 1558. In Spain he continued his studies at the university of Alcalá de Henares. He remained in Spain until 1596 when he returned to the southern Netherlands. His interests in the Dutch Republic were vigorously defended by his sister, Maria of Nassau, against his half-brother Maurice of Nassau who contested his brother's right to the barony and city of Breda. In 1606 Philip William was recognized in the Republic as Lord of Breda and Steenbergen, and his right to appoint magistrates was acknowledged, provided he did so maintaining the "Union and the Republic's religion". He duly made his ceremonial entry into his town of Breda in July 1610 and from then until his death, regularly appointed the magistrates in his lordship. Though he restored Catholic services in the castle of Breda, he did not try to challenge the ascendancy of the Protestant-Calvinist Reformed Church in the city. He had a difference with the States-General in 1613, when they annulled his appointment of a Catholic drost. He had to cooperate with the military governor in Breda, his illegitimate stepbrother Justinus van Nassau, staunchly loyal to the States-General. In 1606 in Fontainebleau, Philip William was married to Eleonora of Bourbon-Condé, daughter of Henry I, Prince de Condé, and cousin of King Henry IV of France, but he died in 1618 without any children. Therefore Maurice of Nassau could at last inherit the title Prince of Orange. As Lord of Diest and a pious Catholic at the time of his death, Philip William of Orange commanded that the parish church of Saint Sulpice in the same city, should celebrate a yearly Requiem Mass for his soul. Diest is also the site of his burial in the Catholic Roman Rite. Diest is known as the "Orange City", and Philip William as "the Catholic prince of Orange", as his father in 1573 – leading the Dutch Revolt – had become a Calvinist Protestant instead of a Catholic as he had been before. Maurice of Nassau (Dutch: Maurits van Oranje; 14 November 1567 – 23 April 1625) was sovereign Prince of Orange from 1618, on the death of his eldest half brother, Philip William, Prince of Orange, (1554–1618). Maurice was stadtholder of the United Provinces of the Netherlands (except in the province of Friesland) from earliest 1585 until his death in 1625. Maurice organised the Dutch rebellion against Spain into a coherent, successful revolt and won fame as a military strategist. Maurice set out to revive and revise the classical doctrines of Vegetius and pioneered the new European forms of armament and drill. Maurice was a son of William the Silent and Princess Anna of Saxony and was born at the castle of Dillenburg. He was named after his maternal grandfather, the Elector Maurice of Saxony, who was also a noted general. Maurice never married but was the father of illegitimate children by Margaretha van Mechelen (including Willem of Nassau, lord of the Lek and Louis of Nassau, lord of den Lek and Beverweerd) and Anna van de Kelder. He was raised in Dillenburg by his uncle Johan of Nassau (Jan the Old). 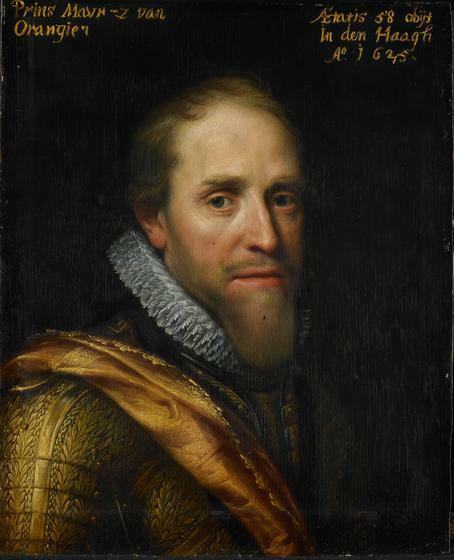 Together with his cousin Willem Lodewijk he studied in Heidelberg and later with his eldest half brother Philip William, Prince of Orange in Leiden where he met Simon Stevin. The States of Holland and Zeeland paid for his studies, as their father had run into financial problems after spending his entire fortune in the early stages of the Dutch revolt. Only 16 when his father was murdered in Delft in 1584, he soon took over as stadtholder (Stadhouder), though this title was not inheritable. The monarchs of England and France had been requested to accept sovereignty, but had refused. This had left Maurice as the only acceptable candidate for the position of Stadtholder. 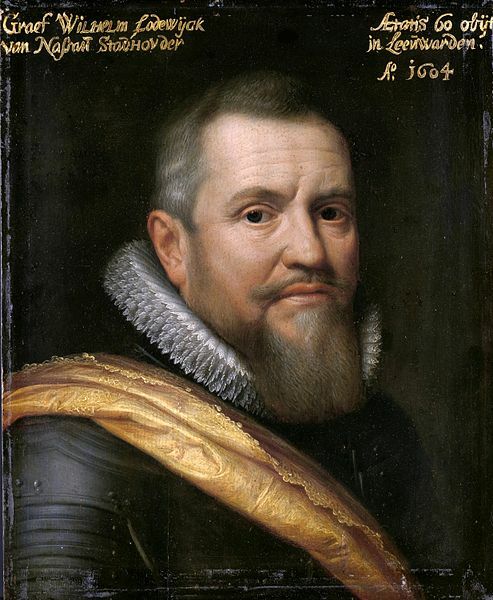 He became stadtholder of Holland and Zeeland in 1585, of Guelders, Overijssel and Utrecht in 1590 and of Groningen and Drenthe in 1620 (following the death of Willem Lodewijk, who had been Stadtholder there and in Friesland). Protestant Maurice was preceded as Prince of Orange (not a Dutch title) by his Roman Catholic eldest half-brother Philip William, Prince of Orange, deceased 1618. However, Philip William was in the custody of Spain, remaining so until 1596, and was thus unable to lead the Dutch independence cause. He was appointed captain-general of the army in 1587, bypassing the Earl of Leicester, who returned to England on hearing this news. Maurice organised the rebellion against Spain into a coherent, successful revolt. He reorganised the Dutch States Army together with Willem Lodewijk, studied military history, strategy and tactics, mathematics and astronomy, and proved himself to be among the best strategists of his age. The Eighty Years' War was a challenge to his style, so he could prove himself a good leader by taking several Spanish Outposts. Paying special attention to the siege theories of Simon Stevin, he took valuable key fortresses and towns during a period known as the Ten Glory Years: Breda in 1590, Zutphen in 1591, Steenwijk in 1592, and Geertruidenberg in 1593. In 1597 he went on a further offensive and took Rheinberg, Meurs, Groenlo, Bredevoort, Enschede, Ootmarsum, Oldenzaal and closed off the year with the capture of Lingen. These victories rounded out the borders to the Dutch Republic, solidifying the revolt and allowing a national state to develop behind secure borders. They also established Maurice as the foremost general of his time. Many of the great generals of the succeeding generation, including his brother Frederick Henry and many of the commanders of the English Civil War learned their trade under his command. His victories in the cavalry battles at Turnhout (1597) and at Nieuwpoort (1600) earned him military fame and acknowledgment throughout Europe. Despite these successes, the House of Orange did not attain great respect among European Royalty, as the Stadtholdership was not inheritable. The training of his army is especially important to early modern warfare. Previous generals had made use of drill and exercise in order to instill discipline or to keep the men physically fit, but for Maurice, they "were the fundamental postulates of tactics." This change affected the entire conduct of warfare, since it required the officers to train men in addition to leading them, decreased the size of the basic infantry unit for functional purposes since more specific orders had to be given in battle, and the decrease in herd behavior required more initiative and intelligence from the average soldier. One major contribution was the introduction of volley fire, which enabled soldiers to compensate for the inaccuracy of their weapons by firing in a large group. It was first used in European combat at the battle of Nieuwpoort in 1600. As part of his efforts to find allies against Spain, Maurice received Moroccan envoys such as Al-Hajari. They discussed the possibility of an alliance between Holland, the Ottoman Empire, Morocco and the Moriscos, against the common enemy Spain. Al-Hajari's account mentions in detail the discussion for a combined offensive against Spain. Maurice was known in his time and by historians as the first general of his age. His reputation rests not as much on his ability to win and exploit field battles as it does on this expertise as a siege commander, military organizer and innovator. He did win two great victories at Battle of Turnhout (1597) and Battle of Nieuwpoort (1600). Bothe these victories were dependent on his innovation of cooperation between arms, with artillery playing a decisive supporting role. 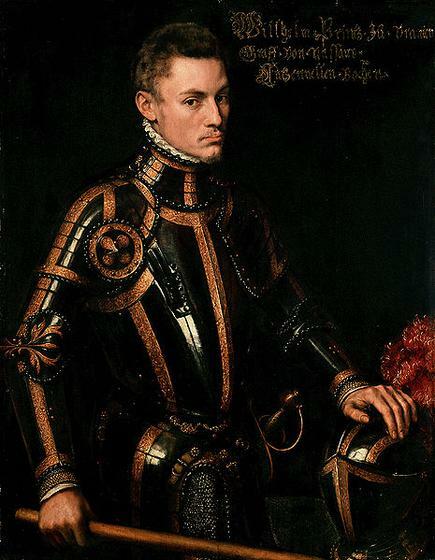 Of his two great adversaries, Alexander Farnese, Duke of Parma and Ambrogio Spinola, he cautiously never allowed himself to be brough to battle with Parma, and did not follow up chances to offer Spinola battle with forces in his favor on the Yssel in 1606. He founded a whole new school of military professional practice. These pointed the way to the professional armies of the future by reapplying Roman tactics and innovating in the fields of logistics, training, and economics (e.g.paying troops regularly and on time). 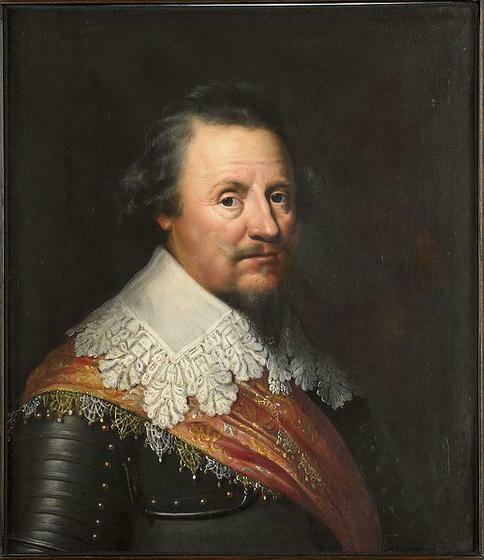 Many graduates of service under Maurice, such as his nephew the Marshal Turenne, or his disciples such as Gustavus Adolphus of Sweden, applied the Mauritian reforms to great effect in the remainder of the 17th century. Maurice started out as the protégé of Landsadvocaat (Land's Advocate, a kind of secretary) Johan van Oldenbarnevelt. But gradually tensions rose between these two men. Against Maurice's advice, and despite his protests, Van Oldenbarnevelt decided to sign the Twelve Years' Truce with Spain, which lasted from 1609–1621. The required funds to maintain the army and navy, and the general course of the war were other topics of constant struggle. With the religious troubles between Gomarists (Calvinists) and Arminians, the struggle between Van Oldenbarnevelt and Maurice reached a climax. Van Oldenbarnevelt was arrested, tried and decapitated despite numerous requests for mercy. From 1618 till his death Maurice now enjoyed uncontested power over the Republic. He expanded the Stadtholder's palace at the Binnenhof in the Hague. The Maurice Tower is nowadays part of the building complex of the Senate of the Netherlands. Maurice urged his cadet half brother, Frederick Henry to marry in order to preserve the dynasty. In 1621 the war resumed after a 12-year period of truces, and the Spanish, led by Ambrogio Spinola, had notable successes, including the siege of Breda, the old family residence of the Nassau's, in 1625. Maurice died on 23 April 1625, with the siege still underway. Justin of Nassau surrendered Breda in June 1625 after a costly eleven-month siege. Meanwhile, the Dutch also lost formerly occupied Baia de Todos os Santos, Salvador de Bahia in Brazil, 1 May 1625, under the heavy attacks of the Spanish–Portuguese Fleet, commanded by the Captain General of the Spanish Navy, since 1617, Admiral Fadrique II de Toledo Osorio y Mendoza (Naples, Italy, May 1580 – 11 December 1634), 1st Marquis of Villanueva de Valdueza, and, since 17 January 1624, Knight of the Order of Santiago. 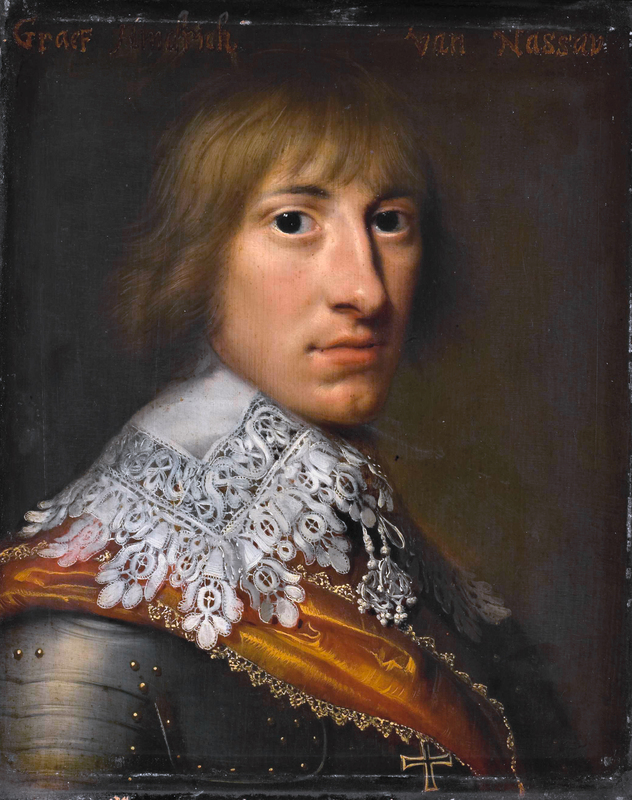 Frederick Henry, or Frederik Hendrik in Dutch (29 January 1584 – 14 March 1647), was the sovereign Prince of Orange and stadtholder of Holland, Zeeland, Utrecht, Guelders, and Overijssel from 1625 to 1647. As the leading soldier in the Dutch wars against Spain, his main achievement was the successful Siege of 's-Hertogenbosch in 1629, It was the main Spanish base and a well-fortified city protected by an experienced Spanish garrison and by formidable water defenses. His strategy was the successful neutralization of the threat of inundation of the area around 's-Hertogenbosch and his capture of the Spanish storehouse at Wesel. 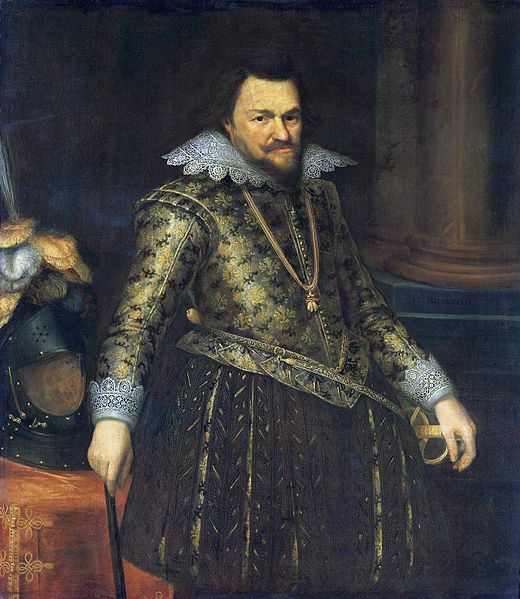 Frederick Henry was born six months before his father's assassination on 10 July 1584. The boy was trained to arms by his elder brother Maurice, one of the finest generals of his age. After Maurice threatened to legimitize his illegitimate children if he did not marry, Frederick Henry married Amalia of Solms-Braunfels in 1625. His illegitimate son by Margaretha Catharina Bruyns (1595–1625), Frederick Nassau de Zuylenstein was born in 1624 before his marriage. This son later became the governor of the young William III of England for seven years. Frederick Henry died on 14 March 1647 in The Hague, Holland, Dutch Republic. He left a wife, a son William II, Prince of Orange, four daughters, and the illegitimate son Frederick Nassau de Zuylenstein. William Louis of Nassau-Dillenburg (Dutch: Willem Lodewijk; West Frisian: Willem Loadewyk) (13 March 1560, Dillenburg, Hesse – 13 July 1620, Leeuwarden, Netherlands) was Count of Nassau-Dillenburg from 1606 to 1620, and stadtholder of Friesland, Groningen, and Drenthe. William Louis was the eldest son of John VI, Count of Nassau-Dillenburg and his first wife, Elisabeth of Leuchtenberg. He served as a cavalry officer under William the Silent. Together with his cousin (and brother-in-law) Maurice of Nassau, Prince of Orange, he commanded the Dutch States Army and helped plan the military strategy of the Dutch Republic against Spain from 1588 to 1609. William Louis played a significant part in the Military Revolution of the 16th - 17th centuries. In a letter to his cousin Maurice of Nassau, Prince of Orange of December 8, 1594 he set out (from reading Aelianus Tacticus) an argument around the use of ranks by soldiers of Imperial Rome as discussed in Aelian's Tactica. Aelian was discussing the use of the counter march in the context of the Roman sword gladius and spear pilium. William Louis in a 'crucial leap' realized that the same technique could work for men with firearms.
" I have discovered evolutionibus [a term that would eventually be translated as "drill"] a method of getting the musketeers and others with guns not only to practice firing but to keep on doing so in a very effective battle order (that is to say, they do not fire at will or from behind a barrier....). Just as soon as the first rank has fired, then by the drill [they have learned] they will march to the back. The second rank either marching forward or standing still, will then fire just like the first. After that the third and following ranks will do the same. When the last rank has fired, the first will have reloaded, as the following diagram shows:. On 25 November 1587, he married his cousin, Anna of Nassau, daughter of William the Silent and Anna of Saxony, and older sister of Maurice of Nassau. Anna died less than six months later on 13 June 1588, and William Louis never remarried. He was nicknamed "Us Heit" (West Frisian for "our father"). He died in his home, the Stadhouderlijk hof in Leeuwarden, the city which honored him with a statue on the government square. His body was laid to rest in the Jacobijnerkerk. Ernst Casimir I of Nassau-Dietz (Dillenburg, 22 December 1573 – Roermond, 2 June 1632) was count of Nassau-Dietz and Stadtholder of Friesland, Groningen and Drenthe.He was the eleventh child of John VI, Count of Nassau-Dillenburg and Countess Elisabeth of Leuchtenberg. After the death of his father, the county of Nassau was divided among his five living sons, Ernst Casimir followed him as Count of Nassau-Dietz. Ernst Casimir was primarily known as an outstanding military leader during the Eighty Years War. He served under Maurice of Nassau, Prince of Orange in the siege of the cities of Steenwijk and Oldenzaal, and Frederick Henry, Prince of Orange during the Siege of Groenlo (1627) and the Siege of 's-Hertogenbosch. As Stadholder of Groningen he founded the Nieuweschans fortress in 1628. Although he owned little in Friesland, he was popular there, and people granted his heir the right to rule after his death. He was killed by a bullet at the Siege of Roermond while he was inspecting the trenches in June 1632. His son, Hendrik Casimir I succeeded him as count of Nassau-Dietz and as stadholder of Friesland, Groningen and Drenthe. Willem Frederik of Nassau-Dietz (Arnhem, 1613-1664), married Albertine Agnes of Orange-Nassau. Henry Casimir I of Nassau-Dietz (Arnhem, 21 January 1612 – Hulst, 13 July 1640) was count of Nassau-Dietz and Stadtholder of Friesland, Groningen and Drenthe. He was the eldest son of Ernst Casimir of Nassau-Dietz and Sophia Hedwig of Brunswick-Lüneburg, and like his father, died in battle. 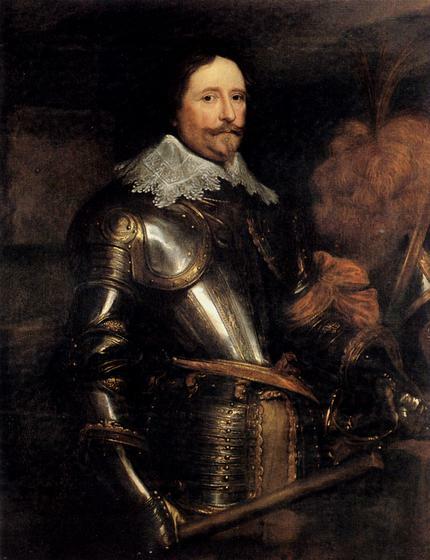 On July 12, 1640, he was wounded in Sint Jansteen at the battle of Hulst. He died the next day. Hendrik Casimir is buried in Leeuwarden, and was succeeded in his titles by William Frederick, Prince of Nassau-Dietz. His death at age 28 caused a series of memorials to his name and the battle in which he died. The Rijksmuseum keeps a blood-stained shirt in the collection supposedly worn by him when he was wounded. Similarly, the bullet hole in his father's hat is also kept there for posterity. On 2 May 1641, William married Mary Henrietta, Princess Royal, eldest daughter of King Charles I of England, in the Chapel Royal of Whitehall Palace in London. In 1647, his father Frederick Henry died, and William II succeeded to both his hereditary titles and his elective offices as stadtholder of five of the seven provinces: Holland, Zeeland, Utrecht, Guelders and Overijssel. The Netherlands at this time was engaged in the Eighty Years' War against Spain for its independence. Under Frederick Henry, the Netherlands had largely won the war, and since 1646 had been negotiating with Spain on the terms for ending it. The negotiators agreed to the Peace of Münster in 1648, but William opposed acceptance of the treaty, even though it recognized the independence of the (northern) Netherlands, because it left the southern Netherlands in the hands of the Spanisch monarchy. A separate peace furthermore violated the alliance with France formed in 1635. However, the States of six provinces voted to accept it. Secretly, William opened his own negotiations with France with the goal of extending his own territory under a more centralized government. In addition, he worked for the restoration of his exiled brother-in-law, Charles II, to the throne of England. 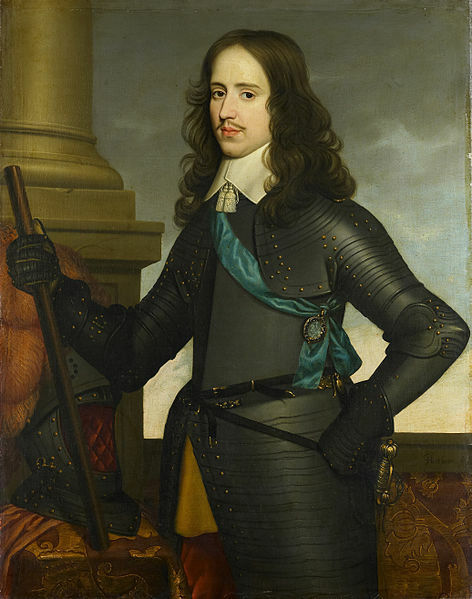 In 1650 William II became involved in a bitter quarrel with the province of Holland and the powerful Regents of Amsterdam, Andries Bicker and his cousin Cornelis de Graeff. With the Peace of Münster, the Regents wanted to reduce the army, saving money. That would also diminish William's authority. William imprisoned eight members of the States of Holland (including Jacob de Witt) in the castle of Loevestein. In addition, he sent his cousin, Willem Frederik of Nassau-Dietz with an army of 10,000 men to seize Amsterdam by force. Bad weather foiled this campaign, but Amsterdam did give in. William served as stadtholder for only three years, until he died of smallpox in 1650. His only son William was born one week after his death. This was the beginning of the First Stadtholderless Period. His son succeeded him in 1672 as stadtholder and later, in 1689, also became King of England. William III (Dutch: Willem III; 4 November 1650 – 8 March 1702) was a sovereign Prince of Orange of the House of Orange-Nassau by birth. From 1672, he governed as Stadtholder William III of Orange (Dutch: Willem III van Oranje) over Holland, Zeeland, Utrecht, Gelderland, and Overijssel of the Dutch Republic. 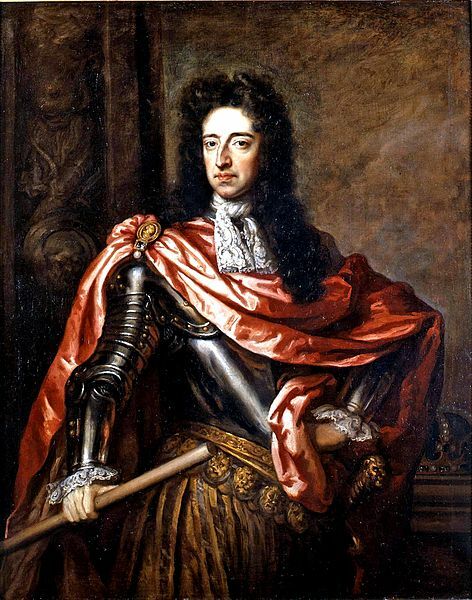 From 1689 he reigned as William III over England and Ireland; it is a coincidence that his regnal number (III) was the same for both Orange and England. As King of Scotland, he is known as William II. He is informally known by sections of the population in Northern Ireland and Scotland as "King Billy". In what became known as the "Glorious Revolution", on 5 November 1688, William invaded England in an action that ultimately deposed King James II and won him the crowns of England, Scotland and Ireland. In the British Isles, William ruled jointly with his wife, Mary II, until her death on 28 December 1694. The period of their joint reign is often referred to as "William and Mary". A Protestant, William participated in several wars against the powerful Catholic king of France, Louis XIV, in coalition with Protestant and Catholic powers in Europe. Many Protestants heralded him as a champion of their faith. Largely because of that reputation, William was able to take the British crowns when many were fearful of a revival of Catholicism under James. William's victory over James at the Battle of the Boyne in 1690 is still commemorated by the Orange Order. His reign marked the beginning of the transition from the personal rule of the Stuarts to the more Parliament-centred rule of the House of Hanover.